How to apply for a RUSSIAN VISA! 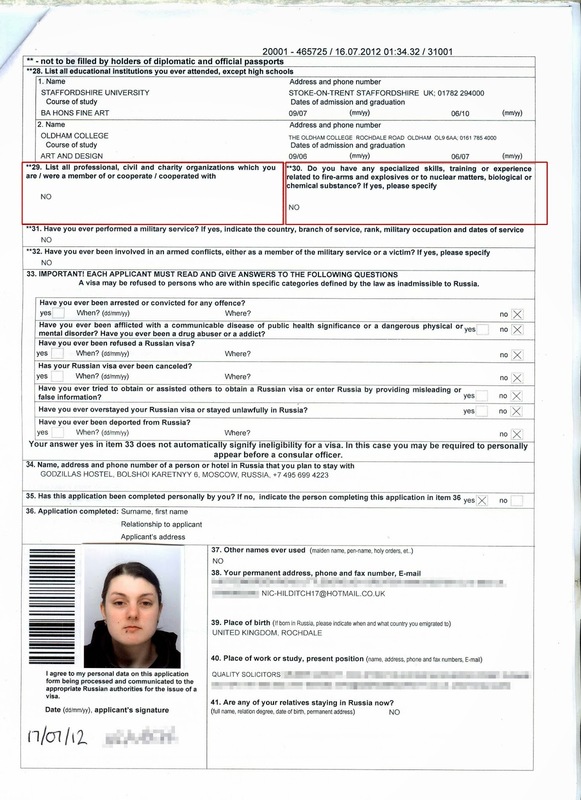 Applying for a Russian visa can be an intimidating and confusing prospect, a little like sitting a final exam for a course you have never been on! But fear not, once you get past all the strange terminology it really isn’t all that hard. Here is my guide. There are many website which offer to do the job for you for a fee. I believe this is not necessary but I am aware some may eventually resort to that, but hopefully this guide will make you see it is quite easy. The whole process should take no more than a couple of weeks at most, but you can get express applications but there is more than one part to the application so I would apply at least a month before in case you have any hiccups and to also save money. What you can look forward too! The first thing you need to do it decide which visa you need, most people will need the Tourist Visa with Single Entry and this is what this guide covers. 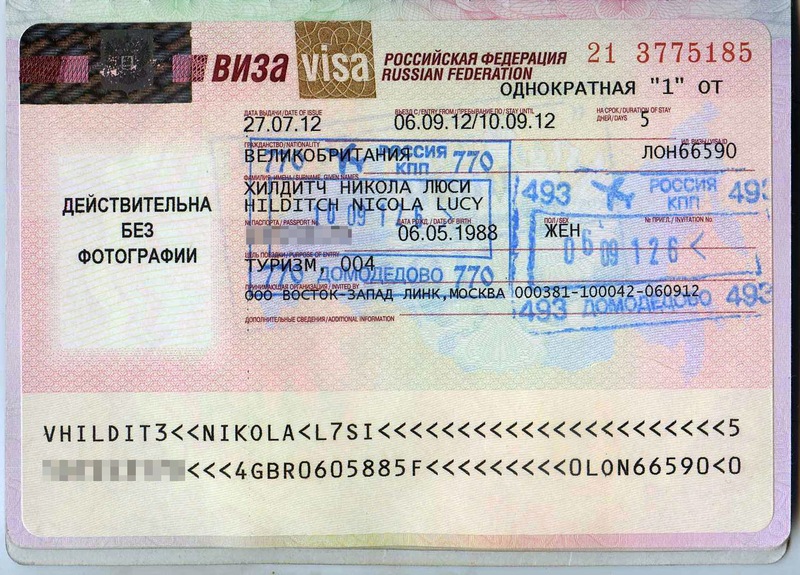 This visa is for people wishing to be in Russia less than 30 days and requires a lot less supporting material than many other types. Having to obtain an “Invitation” to Russia may seem a little daunting at first but really this is just a formality. If anything it seems a little like a pointless loop you must jump through. If you are travelling with a tour company or in a good hotel you might be able to get one through them, but like most backpackers staying in a hostel we had to get our own! 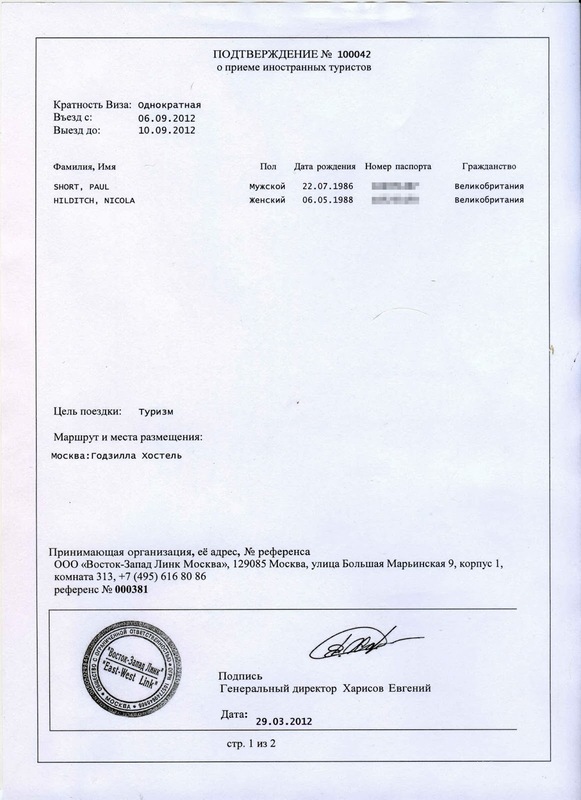 The invitation and voucher come together in a two part document which is able to carry more than one name. The people over at “Get Russian” are also very good at getting back to you if you have any questions. You must register first and can save your progress and return at any time to complete the form. It must be filled out online and then printed off, then signed, dated and a photo attached. Most of the questions on the form are self explanatory but it can be worded a little strange and I know some sections caused me some confusion or just to doubt whether I had filled it in correctly. 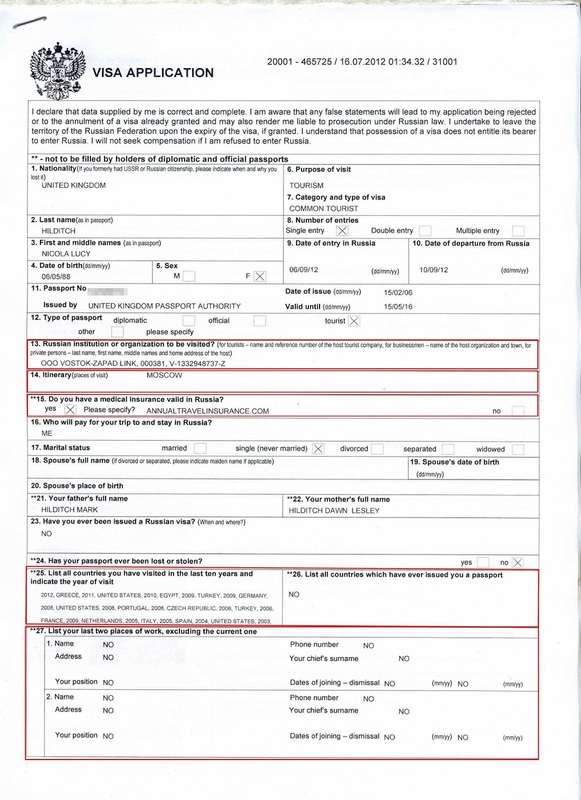 Below I have images of my completed and successful application form and I have highlighted a few questions I feel need clarification. 13. This scary sounding question is just asking for your reference number off your Invitation/ voucher. 14. You could go into great detail here but it is not needed, just the names of the cities you will be staying in will do. 25. This asks you to list all the countries you have travelled to in the last 10 years, this for me was quite a long list and when I printed it off loads were not shown. I was worried this was wrong but again this is totally fine. 26. This is confusing as it seems it has already asked this question but it is asking you for the names of all the countries other than your current passport which have issued you with a passport. 27. I wasn’t sure what to put here as all my previous jobs had been cash in hand here and there whilst studying so I just left this blank and had no problems, this was the same for my husband who has been in the same job since leaving school. 29. I’m not even sure what they are asking here, but as I said earlier when unsure say nothing. Most people have been involved in some form of charity related activity but mentioning that you did a run for the RSPCA last year will cause more confusion and probably isn’t what they are after! 30. This seems a little obvious but when application paranoia kicks in you start to wonder what they mean and what counts. My husband works in a lab with chemicals but really he just makes pigments for fiberglass so unless you are actually making nuclear bombs then I wouldn’t mention that chemistry set you got for Christmas in 1996! General advice would be it is better off not to say anything if in doubt, I think the questions are worded in such a way that it’s not always easy to understand exactly what they want! But giving them too much information, even if innocent, will likely lead to delays and complications! Any other questions about the form just comment below or get in touch direct. Double check all dates and information too! Once you have gathered everything together and doubles checked it, it is time to apply! You can apply in person at the London or Edinburgh office but must be able to collect 7 days later. You can also apply to London via a postal service. These fees can be paid via postal order, bankers draft or download a credit/debit card form online. Now you are ready to send you application and passport off, remember to always send your passport via secure recorded delivery. Russia may seem intimidating but there is nothing at all to worry about and many amazing things to experience. Sights like this make it all worth the hassle! As of 2015 you also need to go through another layer of security which involves fingerprints being taken. Unfortunately this means that you will have to go to the embassy in person for this to happen. But, as of March 2016 you can apply from Manchester too. 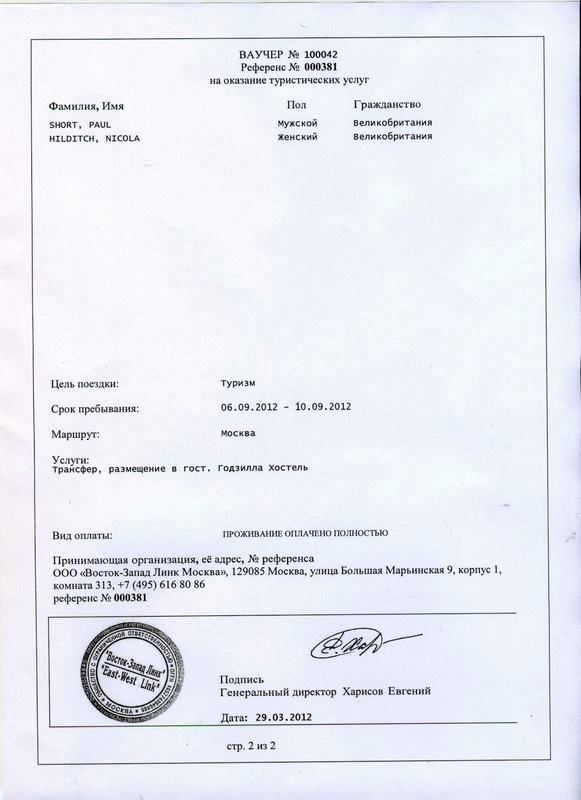 Bookmark this article How to apply for a RUSSIAN VISA! Travel Tattoos. Marking your memories.